The Umbracle is a vantage point of over 17,500 square metres with an exhibition zone from which all the buildings, lakes, walkways, and landscaped areas of the City of Arts and Sciences can be contemplated. Its vegetation is characteristic of the Mediterranean, of the Region of Valencia, and of tropical countries, and changes according to the season of the year; it also contains an interesting exhibition of contemporary sculptures by internationally acknowledged artists in the Art Promenade. 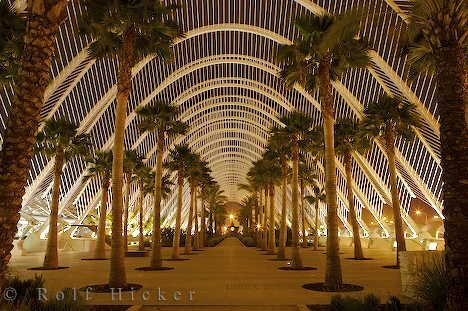 The “Garden of Astronomy” is a open-access area within the Umbracle that complements other astronomy-related elements and activities of the City of Arts and Sciences.